the blog "Foodie With Family". It has been modified to my taste with a couple of additions that aren't staples. Enjoy! 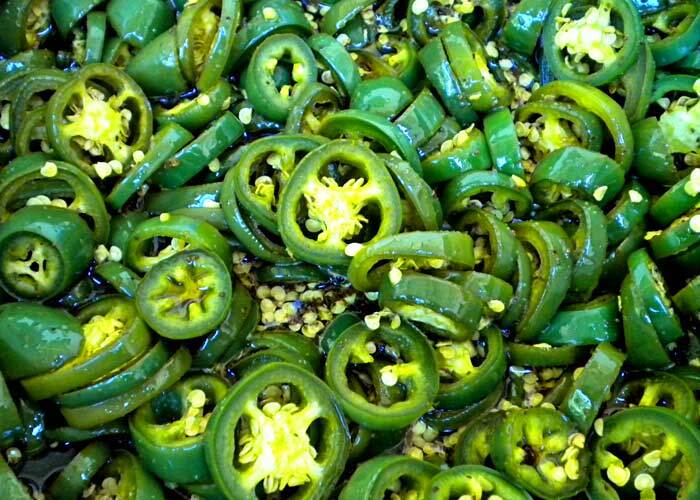 Candied Jalapenos aka "Cowboy Candy"
Remove the stems from all of the jalapeno peppers; slice a small disc off of the stem-end along with the stem. Discard the stems. Slice the peppers into uniform 1/8-1/4 inch rounds. Set aside. In a large stainless steel pot, bring cider vinegar, white sugar, turmeric, celery seed, granulated garlic, granulated onion and Chipotle pepper to a boil. Reduce heat and simmer for 5 minutes. Add the pepper slices and simmer for exactly 4 minutes. Use a slotted spoon to transfer the peppers, loading into clean, sterile canning jars to within 1/4 inch of the upper rim of the jar. Turn heat up under the pot with the syrup and bring to a full rolling boil. Boil hard for 6 minutes. *If you have leftover syrup, and it is likely that you will, you may can it in half-pint or pint jars, too. It’s wonderful brushed on meat on the grill or added to potato salad or, or, or… In short, don’t toss it out! Place jars in a canner, cover with water by 2-inches. Bring the water to a full rolling boil. When it reaches a full rolling boil, set the timer for 10 minutes for half-pints or 15 minutes for pints. When timer goes off, use canning tongs to transfer the jars to a cooling rack. Leave them to cool, undisturbed, for 24 hours. When fully cooled, wipe them with a clean, damp washcloth then label. Allow to mellow for at least two weeks, but preferably a month before eating. Or not.